A bar in Madrid’s Plaza Mayor. Many of the photos on the wall are of gorings of toreros. I guess they’re trying to make the point that the bull actually does have a chance. You can take a mini tapas tour of Madrid just wandering around the Plaza Mayor and adjacent streets. Here are five things I love about Madrid. I find myself going back to the same places over and over again, not because I’m lazy, but because they’re just that good. Here’s a very abbreviated list of the best museums and the best tapas in Madrid. However, I pretty much love every other thing about Madrid. As my daughter once put it after a five day visit to each city, “I prefer to party in Barcelona, but I’d rather live in Madrid.” That’s exactly how I feel about it. The Prado Museum. I’ve been to most of the great museums in Europe–The Uffizi, the Riksmuseum, the Louvre, but when it comes to a distinguished collection, consider this. Spain was the richest country in the world in the 16th Century and King Felipe IV basically gave his court painter Diego de Velasquez a blank check to buy the best paintings in Europe. As a consequence, you have Caravaggios and Titians representing the greatest of the late Italian Renaissance, and of course the best works of Velasquez himself. But, among the huge volume of expected works are two of my very favorite paintings: Roger van der Weyden’s Descent from the Cross, and the mind bending Garden of Earthly Delights by Hieronymous Bosch. Then there are Goya’s darkest works. No other museum can touch the Prado’s breadth. You can go twenty times and see something new each time. Check out my post on my five favorite painting in The Prado here. The Reina Sofia. What The Prado is to classical Renaissance work, the Reina Sofia is to Spanish Modern Art. Dali, Miró, and of course, Picasso. Guernica has a well-deserved room to itself. Monastery of the Descalzas Reales. This is not a museum, per se, but it’s a little oasis of interesting art and history in the middle of the center of old Madrid. Some very interesting tapestries and more, which you can read more about here. There’s at least a small demonstration damn near every day in the Puerta del Sol. And Sol is also the best jumping off point for a walk to the best museums and the best tapas in Madrid. Rincon de la Cava. There are thousands of bars in Madrid, and hundreds of good restaurants. Tapas and raciones for all tastes abound. But for authentic Spanish cuisine, i.e. cured meats and cheeses to go with a nice glass of Rioja, it’s hard to beat the bar at Rincon de la Cava. It’s located just a few doors up the street from the famous El Botin on Cuchilleros Street and is right next to Plaza Mayor. Go there with three friends, order the mixed plate of meats and cheese, and a bottle of wine. That, in a mouthful, is Madrid. The Mercado de San Miguel. When I lived there in the 70s, this was our food market. Now it’s been transformed into a hundred counters where you can get multiple varieties of olives, tapas, sherries, and anything else you can imagine eating or drinking. Move from vendor to vendor and try different tastes, or just stand at the sherry bar and try their vast array of every type of sherry, from very dry to very sweet. Buy an assortment of olives from the counter right next door and mix and match. Puerta del Sol and Plaza Mayor. I lump these together because they’re very close to each other and both could claim to be the epicenters of Madrid Culture. The Puerta del Sol is a large square from which walking streets lined with stylish shopping and tapas bars radiate. 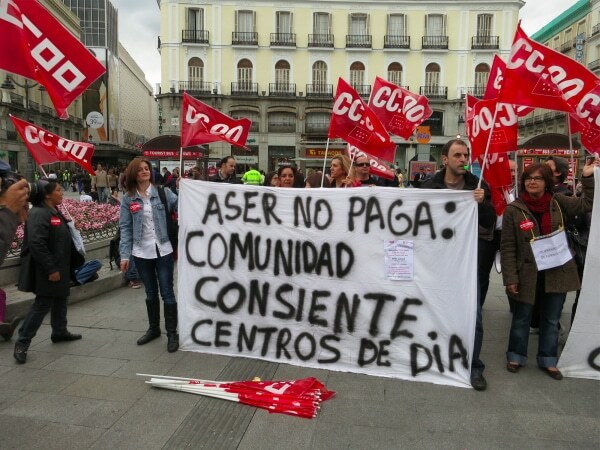 Sol is also the center of all things spontaneously political in Madrid. The Spanish are passionate about their causes, and any demonstrations against government austerity measures, or any other matters of the day, will always start here. The Plaza Mayor, on the other hand, is the mellow counterpoint to Sol. It’s a square dominated by outdoor cafes where you can sit and watch street musicians and other performers throughout the night. The Spanish have a word–trasnochar– which means to “go all night.” Plaza Mayor, especially in the summer, is the center of Madrileños’ propensity to do just that. 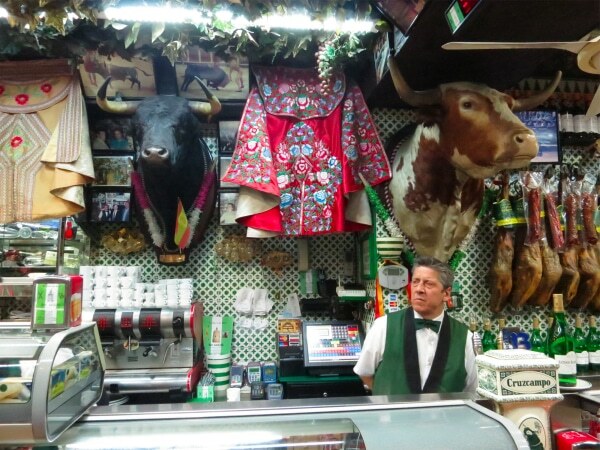 Here are a few more suggestions of places to eat in the Puerta del Sol neighborhood. And, if you want a real Madrid tapas tour, you might consider digging into the Madrid Food Tour, too. I feel like I’ve been in that bar in the Plaza Mayor. A local friend took me to one of the bars there many years ago for beers before dinner. I haven’t spent much time in Spain, but I remember Madrid more fondly than Barcelona. I think it’s because I’ve tended to eat better in Madrid. Well, the food in Barcelona is extraordinary, too. I’d probably rate it above Madrid’s cuisine, but only because of the seafood, which is rarer in Madrid. But, if you want roast meat, jamón and sausage, Madrid is hard to top. I’ve been to the other museums you named but not Prado. I’m going to have to rectify that soon! Hope you two are all settled in. A toast to your pals back home, please, with the next glass of Rioja. Damn, you made it sound so good (and you are right!) that now every Tom, Kris, and Audrey is going to want to go there and overcrowd it for the rest of us. The more the merrier, Ann. You should take a break from walking and join us. Brock, even the tourist books are right sometime. The top attractions are sometimes just the best. I love that film of the musicians, and the BMX riders hopping over their tin! Nice piece. I agree that you don’t really get Madrid until you stay up very late partying. You probably know the Madrileños are nicknamed “los gatos” (the cats) for their enthusiasm for staying up all night. So I guess this means we won’t be enjoying the street music with you. We will be in Spain in September.